When you browse the web with mobile Safari, you’ll come across sites that ask you to create a login, and that usually requires a password. 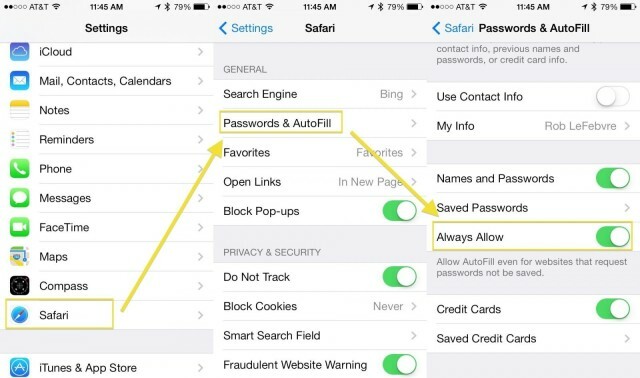 You can save your passwords in mobile Safari automatically, but there are some sites that request passwords not be saved. There’s a workaround, though, if you feel like you should be able to save whatever passwords you darn well please, and it’s buried in the Settings app. Tap into your Settings app and then swipe down to Safari. Tap there and then tap on Passwords & AutoFill. Once there, swipe your way down a bit until you see the section with Names and Passwords, Saved Passwords, and Always Allow. Toggle that last one to ON and then your iOS device will “Allow Auto-Fill even for websites that request passwords not be saved.” It says it right there on the screen, so you know it’s true. Now you’ll be able to create stronger passwords with Safari’s password generating tools and not have to remember them, since your mobile Safari will keep track for you. This will add some risk for your privacy, of course, but if you want to, you can always turn the feature completely off.